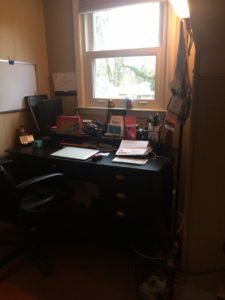 A couple of weeks ago I had the pleasure of working with a friend who took her nutrition business from pretty good to completely awesome this past year. 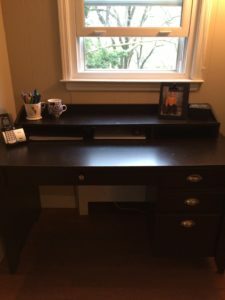 She and her husband are a team, work long hours, live in a small apartment with their adorable son and needed an organizing boost to keep trucking with their fantastic business trajectory. 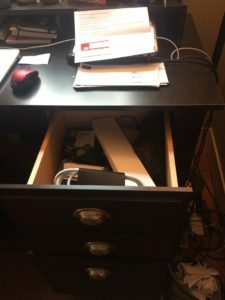 My client decided that she could no longer make deals worth thousands of dollars when her desk was in total disarray. When I walked in, I observed that her actual life was not disorganized. There were places for things and she knew where to find certain paperwork but there was too much of it, no clear order and zero visually calming place to rest her eyes while she was focusing on making big bucks. 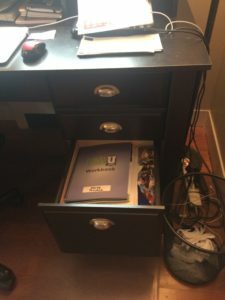 The top of the desk housed papers, business cards, little inspirational trinkets, two pairs of gloves, four cups of pens and other office supplies, greeting cards and a box of electronics. It’s a small desk, as you can see. That’s way too much stuff to be at your fingertips for a daily jump at productivity. The top drawer held cords and disorganized supplies. 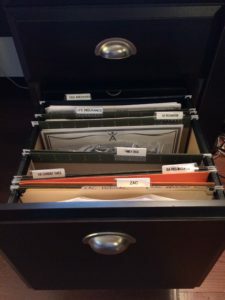 The bottom drawer held manuals, guides, important tax papers, insurance info and kid paperwork. It was piled on top of itself with no order. It was contained, sure, but had no discipline. My client does 90% of her billing online. 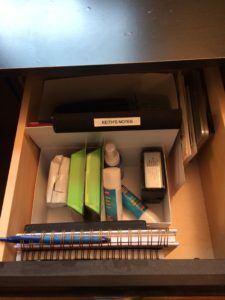 The top drawer has less stuff and she can easily grab what she needs because we used two small boxes to separate and contain her supplies. We literally cut up a couple of empty granola bar boxes and stuck them in the drawer. There are thousands of products available out there but sometimes you can find exactly what you need in your own home for free! Ah, so refreshing! She can see her beautiful view from the window. She can appreciate her adorable son’s photo. She can neatly tuck her laptop into the cubby at the end of the day. She now has exactly one cup for pens and one cup for other little knickknacks. Clarity and order prevail and more business success awaits her. Is clutter getting in the way of your business? Is there always something clogging up the works preventing you from accomplishing your goals? There is a clearer way!